While the last 10 years have unfolded in ways that I could never have predicted (and had I, I’m not sure that I would have had the guts to actually leave), I can honestly say that I’ve never looked back or regretted my decision to leave. I’ve dealt with more and bigger challenges than I ever thought I would, and I’ve also had more impact than I could have hoped. All this while watching my son grow from 6 to 16 (yes, it was my son who was the inspiration of the “Tell It To Me Like I’m A Six-Year-Old” post), watched my daughter grow from 3 to 13, and seen my marriage evolve from 8 to 18 years. So, I’ve been thinking for a while about what I wanted to focus on for my 10 year anniversary post, and I settled on 10 valuable lessons that have helped me stay sane and grow what is today a solid, profitable, fast growing business. 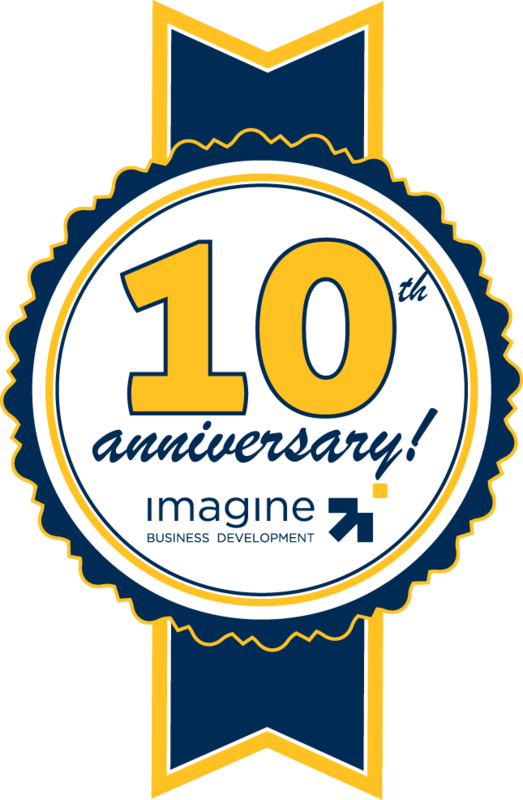 I like to think of Imagine as a 10-year-old startup, and these lessons have been instrumental in enabling us to keep a startup mentality, while we build the stability and structure of a company entering its 11th year. I remember when I first heard this lesson. My initial thought was, “Sounds great, tell me how do I stop thinking?” While this is the lesson I still struggle with today, I’ve learned how to live with it. Sometimes things are what they are. I’ve found that the balance that I should strive for in business is that fine point where I let things happen and still work to control my destiny. This means I’ve had to let go in ways I could never have imagined, but when I do, progress accelerates. It’s not always the most comfortable for me, but it is the most effective. 2. Listen, But Don’t Follow. I listen to everything. I listen to my clients, my prospects, co-workers and advisors. Yet, I never follow. Success and growth is unique for everybody. No two journeys are identical. The key is to keep a learning posture with everything you do, and the confidence and command to set your own journey. I wrote a blog post on this subject, so I’ll let the link stand on its own. While I think the business you’re in greatly influences how important delight is, when you’re in a B2B services business (and many others) delight often decreases loyalty and profitability. Why? It forces you to focus on the wrong things. People don’t want to be “delighted;” they just want what they want, when they want it. At Imagine, our job is to get executives to do things that don’t come naturally to them. This means that we often have to push and cajole them to leave their comfort zone. If we’re focused on “delighting” we won’t have the muster to challenge them when they need to be challenged. And if we didn’t do that, I wouldn’t have a business. I’ve always liked the movie The Shawshank Redemption. In the movie, the protagonist, Andy Defresne, escapes from prison; but first he must crawl through a half a mile of sewage. As I shared in my book The 11 Laws of Accelerating Business Growth, if you’re going to crawl through a half a mile of sewage there better be something really good on the other side. For Dufresne it was freedom. For entrepreneurs it’s their dream. Rest assured, no matter how big the dream, or how smart the entrepreneur or executive, you’re going to have to get through the sewage before you get the reward. 6. There’s Always Some Luck. I’ve always prided myself on being a really good strategist. I’ve learned that I’ve over-relied on strategy. Too much focus on strategy will kill the ultimate growth accelerator – luck! I’ve increasingly become a believer that the real purpose of great strategy is to enhance the springboard of luck. A close cousin of the sixth lesson, I’ve learned that the great payoff of letting go of some control is that amazing accidents happen. More often than not it’s the accident that has more power and greater value than whatever was initially intended. When I look at where we get our revenue today, 95% of what we’re doing came as a result of an accident. Actually, my proudest strategic accomplishment is that I let some great accidents happen. 8. The critical importance (and overemphasis) on people. Make no mistake – people are critical to the success I enjoy today. They’re even more critical for our plans tomorrow. But, there’s also a tendency for smaller, growing businesses to overemphasize people in the equation. The platitudes get thrown at us – get the right people on the bus, get a good #2, hire high. And, while many of these rules are perfect for larger companies or highly funded companies, there’s a lot of truth in the idiom that you can have too many chefs trying to cook the meal. For years I pursued a strong #2 (a Ballmer to my Gates as peer advisors would tell me), when the reality was that I needed people to execute the vision. What’s funny is that when I stopped working so hard to get a good #2, and I focused on the vision and how I could best execute it, the right people started showing up. I love to collaborate. There’s nothing more fun and energizing that have really good people wrestle with ideas and push and pull things apart. I remember when I was at an employee’s Super Bowl party and he introduced me to his friend and parents as “My boss.” I looked around, uncomfortably, to see who he was talking about. I’ve never liked being a boss. I want people to be engaged and to do things because they want to do them, not because I told them to. I’ve learned that this philosophy lets my employees and myself down. I’ve got a big vision, it’s my job to bring the leadership and accountability to help us all overcome our challenges. 10. Let go of your best ideas. As an ideas person, this was tough for me. I love ideas and I love to make them better. But, I’ve learned that the best idea doesn’t win the game. Rather it’s the idea that rallies the right people. Let go of your best ideas, and the ideas that can best help you grow will shine through. Well, that’s been my journey. I’d love to hear what lessons you’ve learned along the way, so please feel free to share in the comment section below.